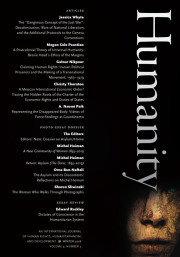 Abstract: There is something distinctly ritualistic about the Preamble in international human rights instruments: in its repetitiveness both within and across legal instruments; in its logical ordering of the universe, connecting what has gone before (‘whereas’: human nature, crisis, recognition) with what must follow (‘therefore’: the law, this law); in its very style and representation. This suggests that the Preamble is more than a literally useful passage at the start of the text for lawyers to get to the law, but also something like a rite of passage, a performative calling-forth of ‘what goes before’ so that universal human rights might follow. This paper examines what such a reading of the Preamble in international human rights law as a ritual might reveal about universal human rights, and what it might reveal about the ‘problem’ of human rights ritual/ism. Shane Chalmers is currently a teaching fellow at Melbourne Law School as well as a visiting fellow in the School of Regulation and Global Governance (RegNet) at the Australian National University, where he earned his doctorate in 2016. His dissertation, "Liberia and the Rule of Law,'' combined a historical study of the colonial origins and making of Liberia with an empirical study of the everyday life of law in Liberia and law's role in remaking the nation-state after war.